More than 30,000 people in the United States are living with Cystic Fibrosis, and approximately 1,000 new cases of CF are diagnosed each year. A progressive, genetic disease caused by a defective gene mutation, Cystic Fibrosis is a potentially deadly disease that causes persistent lung infections and restricts the ability to breathe over time. More than 75% of those affected are diagnosed by age 2. 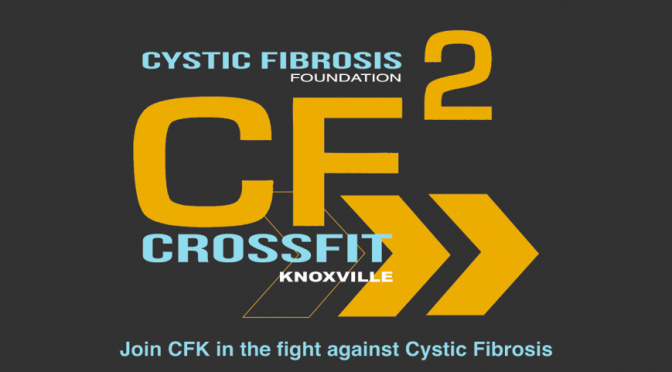 Come join us for a friendly competition to raise awareness and fundraising dollars to help those living with Cystic Fibrosis in Tennessee. One hundred percent of proceeds will be donated to the Cystic Fibrosis Foundation! Date & Time: Saturday, February 10 2018 @ 10:30 a.m.
*Final day to register and receive a t-shirt is Thursday, February 1! Those registered after 2/1 will not receive a t-shirt. As with the symptoms and demands of the disease, this competition will include one lung-demanding workout designed to challenge athletes’ airways and ability to breathe.